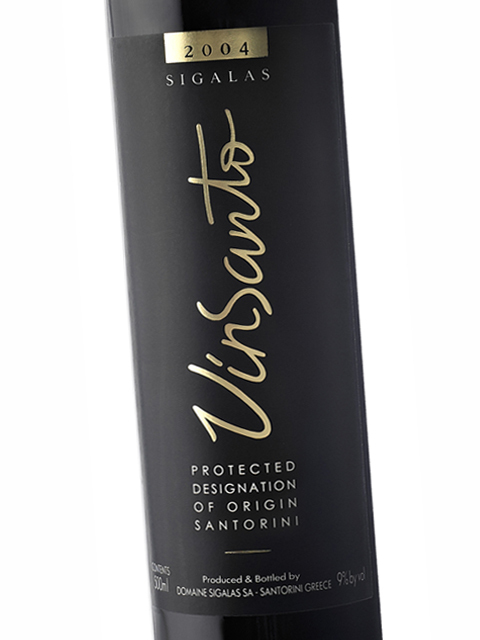 Santorini Vinsanto is a top-quality white dessert wine made from sun-dried grapes. Its history dates back to antiquity, peaking during the Frankish rule (13th century). Today, it is reliving the glory days of the past. 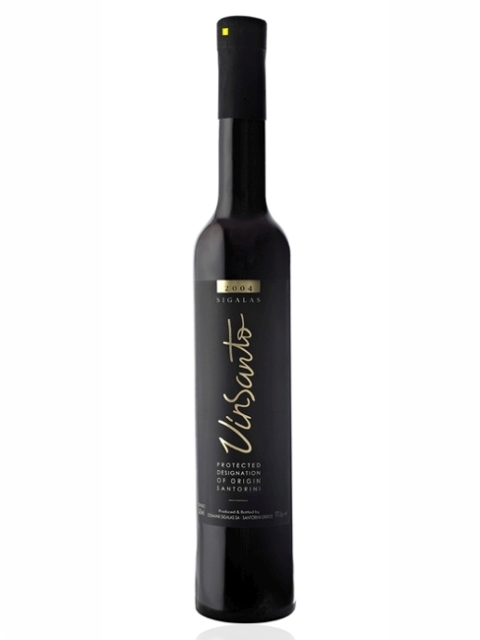 Domaine Sigalas produces one of the finest versions of Vinsanto on the island. The vines of the Domaine are over 50 years old and are located on the northern part of Santorini, planted on a mixture of black lava, volcanic ash and pumice. This unique soil composition produces grapes – and later wine – with high acidity and a wonderful mineral character. The grapes of the Assyrtiko and Aidani varieties are late harvested and sundried for 12-15 days, so that they may dehydrate and develop condensed aroma and flavour. This is followed by alcoholic fermentation and ageing in old oak barrels for about 7 years. 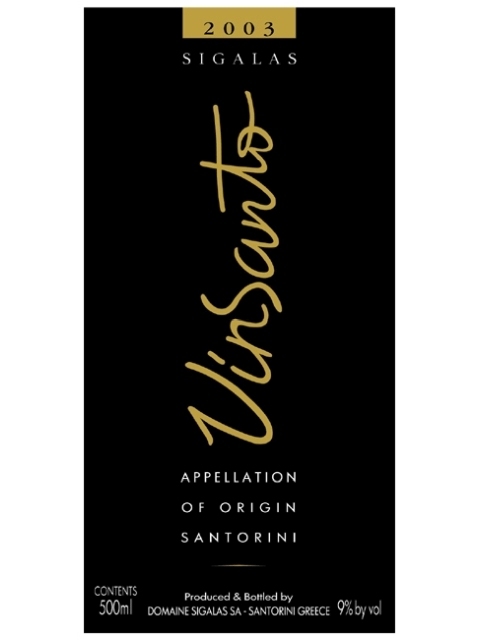 Domaine Sigalas Vinsanto has a magical aromatic and flavour profile, reminiscent of honey, caramel, raisins, orange peel, amaretto liqueur, plum, dried figs, sweet spices, wax, chestnut spoon sweet, apricot jam, dried fruits and mineral notes. The wine’s highly condensed character is due to the sun-dried grapes and the exceptionally low yields (3500 kg / hectare). It has low alcohol content, while its sweetness is balanced by its high acidity. This legendary sweet wine that seamen of the Middle Ages used to take with them on their way to the Holy Land, Constantinople, the Black Sea and the bustling Venetian ports of the Mediterranean promises to thrill modern wine lovers. It is an excellent dessert wine that can be served after any meal on its own or accompanying desserts, such as chocolate and lemon mousse, cocoa crème brûlée, chocolate-chestnut pies and crème caramel. 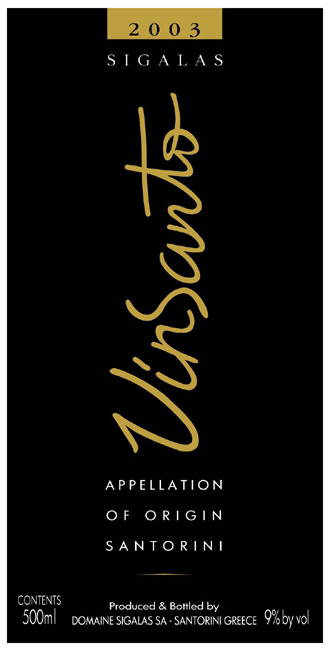 Clean, medium (+) intensity, with aroma characteristics reminiscent of honey, caramel, raisins, lemon, orange peel, amaretto liqueur, plum, sweet spices, candle, incense, apricot jam, dry nuts and mineral notes. Sweet, high acidity, low alcohol, full body. Medium (+) flavor intensity with flavor characteristics reminiscent of chestnut spoon sweet, honey, caramel, dried figs, quince, caramelized dry nuts, coffee, beeswax and sweet spices. Medium (+) finish.